In e-commerce, there are two different types of marketplaces- horizontal and vertical. In a horizontal marketplace, the seller offers different category products focusing buyers from all sectors. In simple terms, it means selling everything to everyone. It is a one-stop shop for various needs of customers. The most famous horizontal marketplace is Amazon. It sells books, furniture, clothes, shoes, toys, gadgets, and much more. In a vertical marketplace, the seller offers products on a particular category focusing the buyer belonging to a specific sector. This focus on distinct product categories that foreground the special features of the product category. It basically targets niche markets. 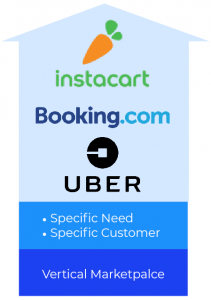 For example- Instacart – selling groceries, Myntra – offering clothing, Esty- handmade, Booking.com, and Airbnb – hotel booking, Uber and Ola – car on rent.